Parkway also will invest $750,000 in new equipment and purchase $20,500 of net-new Virginia-grown agricultural products to help fuel the company’s expansion beyond the Commonwealth, Virginia’s secretary of agriculture and forestry, Basil I. Gooden, announced at news conference at the brewery today. The City of Salem will match the Governor’s Agriculture and Forestry Industries Development Fund (AFID) award amount of $150,000 with a cash grant of $150,000 that will be paid out to the company. The city’s matching funds will be used for building improvements. The company is also eligible for an estimated $4,800 in grant funds from the Virginia Jobs Investment Program (VJIP) to be used for job training. Parkway currently operates four vessels with a 17,000-barrel capacity specializing in distinctive ales. 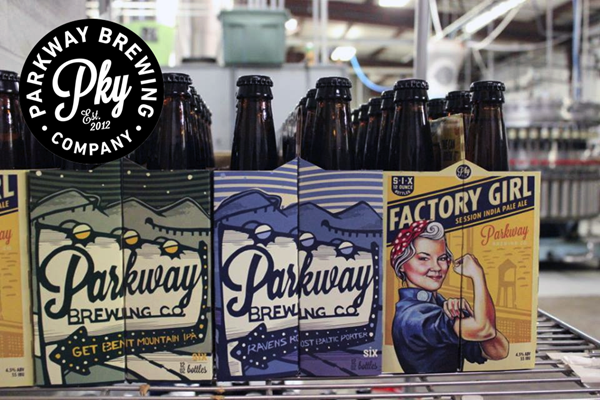 Founded in 2012, Parkway Brewing offers several beers exclusively on-site as well as flagship beers sold in bottles and kegs throughout Virginia. Currently producing more than a dozen varieties of styles, Parkway plans to expand into surrounding states. Parkway’s convenient location on Kesler Mill Road off Interstate 81 makes it a popular destination for visitors to enjoy beer and music. Craft beer is a $23.5 billion market, according to the Brewers Association, with a 10 percent dollar-sales growth in 2016. Craft beer production increased 6 percent last year, representing 12.3 percent market of the overall beer industry.